Description: This is a fleshy bryozoan, which is sometimes mistaken for a tunicate or sponge. It consists of thin finger-like growths, variously branched or webbed together. When undisturbed small white zooids with a crown of tentacles emerge from all surfaces. Habitat: Very common in the sublittoral zone in a wide range of habitats, attached to rocks or shells. Distribution: Widespread all round the British Isles. 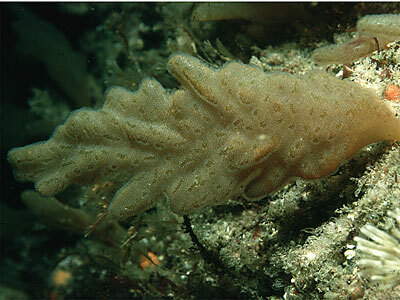 Similar Species: Some other species of Alcyonidium are similar and others are encrusting. Picton, B.E. & Morrow, C.C. (2016). Alcyonidium diaphanum (Hudson, 1762). [In] Encyclopedia of Marine Life of Britain and Ireland.